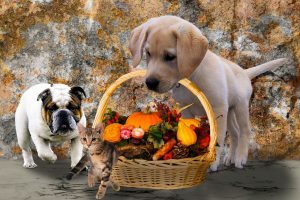 Pooch Sitters is a professional in-home pet care service providing loving, reliable and affordable care for your pets. Our mission is to treat your pets and home with the love, care and respect we use to treat our own. We believe in nurturing pets in their home environment and helping them follow a consistent and reliable schedule so that you return to a happy pet. 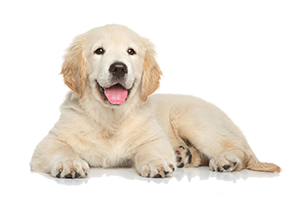 Your pets will be personally taken care of by one of our insured and bonded Pooch Sitters. 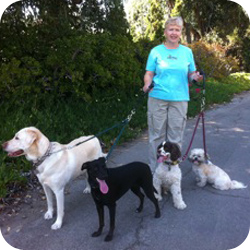 Our Pooch Sitters are American Red Cross First Aid Certified. Olga has been a pet loving person all her life. She has a background in customer service and pays attention to detail. 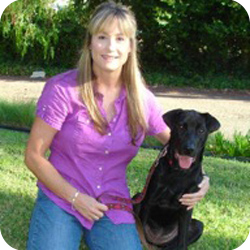 She is a compassionate person who will give lots of love to your pets. 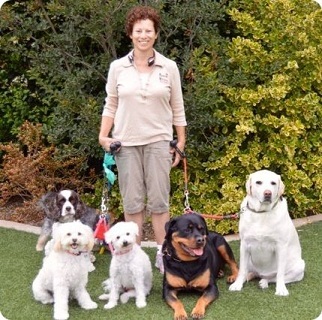 Kathy has a long history of managing a large kennel facility. She now enjoys the one-on-one pet care that we provide our clients. 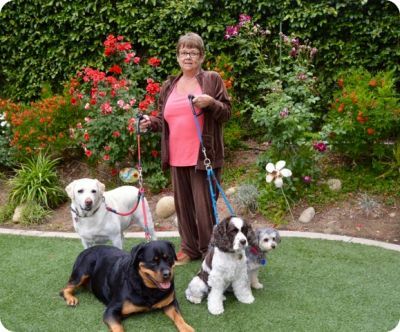 Kathy lives in Tustin with her family and rescue dogs. Lisa Moreno is our Co-Founder of Pooch Sitters (2003), Healthy Paw Supplements (2018) and Pooch Sitters Pet Gifts (2018) and our Lead Pooch Sitter in Northern California. Lisa has an extensive background in Customer Service, Sales, Marketing and Management. 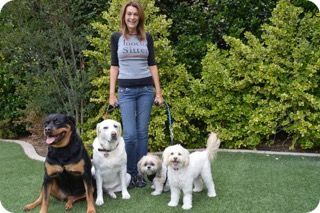 She has three of her own dogs and has always had a strong affection for animals. Susan’s love of animals goes back to her childhood living on a farm and belonging to the local 4-H club where she showed animals at the fairs. Later on while she was working at the irvine animal care center as a kennel attendant she decided to go back to school and make this a career. She graduated from Mt. San Antonio College with an associates degree in animal science. She then went on to pass the board exam becoming a Registered Veterinary Technician. Working as a techician she later got involved with the aneshesia free dentals and was hired on as a non- anesthetic dental hygenist for dogs and cats. She now has an 11 year old cat named Addy and recently rescued a 6 mo. old black lab named Annie, lives in Anaheim Hills and is very close with her family. 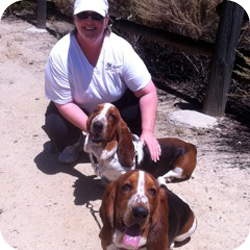 Samantha was born and educated in the United Kingdom; she has lived and worked in sunny Orange County since 1984. Samantha grew up in the English countryside with an assortment of creatures great and small including, guinea-pigs, rabbits, gerbils and dogs. 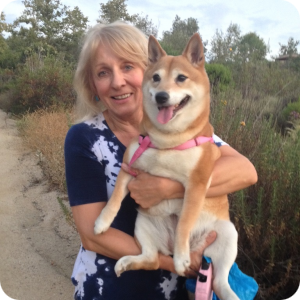 She currently lives in Irvine with her parents and their anti-social feral cat called Willum.Samantha is our primary Pooch Sitter for the Irvine area. Hi, my name is Anita and I am a long time resident of Orange County and live in Anaheim with my two ten year old doxies, Toby and Abagail my kids! Their individual personalities make them so wonderful and unique! My parents believed that your pets are part of the family. Consequently, when we have family gatherings(I am one of six children), there are more dogs than people running around and I would not have it any other way! 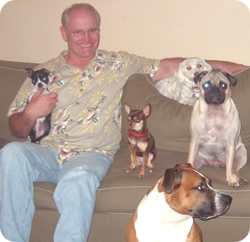 It’s great to be part of the Poochsitter family of animal lovers! 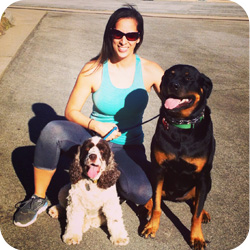 I support Pooch Sitter clients in the Anaheim Hills area. Steve is Mayra’s hubby and 2nd Hand. He keeps watch of all the Pooch Camp boarders while Mayra is out taking care of pets in their homes.